June in Northfield means graduation and summer vacation. 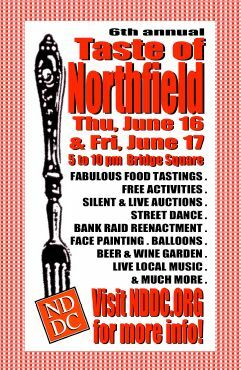 It also means that one of the best-loved community events of the year, The Taste of Northfield, is almost upon us. This year will be the 6th Annual Taste and the event is scheduled for Thursday, June 16th and Friday June 17th from 5-10 p.m. both evenings. All of the festivities happen in or near Bridge Square in Downtown Northfield. What a fantastic location for fun! There will be a dozen or more food vendors (we’re still working on the lineup) surrounding the Square serving up their own special menus. There will be entertainment on the Showmobile both nights and a Beer and Wine Tent on the 4th Street bridge. The James Gang will do a Bank Raid re-enactment on Thursday night and Friday will bring the return of both a Silent Auction and a Live Auction. Both nights will feature a Street Dance from 8-10. If you’re feeling up to it, this event also brings a great opportunity to volunteer. We need folks to sell tickets, police the waste stream, control admittance to the Beer Tent, tally up the silent and live auction bids, you name it! If this possibility speaks to you, contact rcurrier@nddc.org.